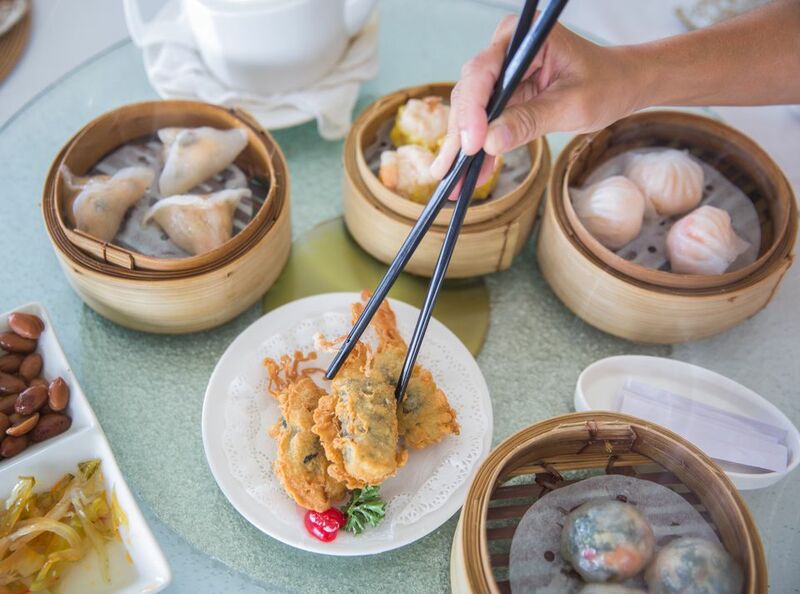 Dim sum is generally presented and eaten family style, meaning that the small plates are shared amongst the table and, because of the small portions, diners are able to try a variety of dishes. The typical dim sum menu will include various types of steamed buns, rice noodle rolls, and dumplings, all of which will include a range of fillings and ingredients from pork to prawns and chicken to vegetables. Given the wide range of dim sum dishes and the way in which a person typically orders, many first-time dim sum restaurant-goers must simply jump in feet first or allow a more experienced member of the party order. With this descriptive guide, anyone can be ready to master the typical dim sum menu. Rice noodle sheets are filled with shrimp, beef, or pork, then steamed or pan-fried. Squid or cuttlefish is marinated in a curry sauce and steamed. These have a similar filling to Taro Dumplings (Wu Gok) but are covered in a wrapper and in a pastry made with glutinous (sweet) rice before deep-frying. A steamed custard that may include meat or seafood. Chicken's feet. They are usually stir-fried or deep-fried, then marinated, and finally, steamed. The marinade often includes black bean sauce and/or oyster sauce. Like the more famous har gau (see below), these dumplings are translucent dumplings. They are filled with pork and bamboo shoots. Those great shiny, translucent shrimp dumplings. The transparency of the dumpling wrapper comes from using wheat starch in the dough. Chinese dumplings. Although Chinese dumplings may be cooked in many ways, when people refer to jiaozi, they generally mean dumplings that are boiled in water or broth. Gow gee, on the other hand, is frequently pan-fried. A cake made with Chinese turnip, which is similar to the Japanese daikon radish, and rice flour (not glutinous rice flour). The steamed cake is a popular dish during the Chinese New Year’s season but is also served for dim sum throughout the year. Sticky rice and meats (often including Chinese sausage) wrapped in lotus leaves. A light, refreshing dim sum dessert made with sweet fresh mango fruit. Balls of glutinous rice flour and brown sugar are filled with sweet red bean paste, rolled in sesame seeds, and deep-fried. A shrimp paste mixture is spread on toast points and deep-fried. Made with a thinner wrapper, spring rolls are lighter and less filling than egg rolls. A classic spring roll filling consists of dried mushrooms, and shredded meat, and carrot or bamboo shoots. The filling is generally, seasoned with oyster sauce, soy sauce, and sugar. Purple eggplant is stuffed with a shrimp paste, fried, and then topped with sauce. Squares of green bell pepper are covered with shrimp paste and fried. These distinctive looking dumplings are shaped like a basket with the filling sticking out over the top. Siu Mai has a shrimp and pork filling, with a bit of crab or fish roe sprinkled on top. The dumplings are steamed. These delicious deep-fried dumplings have a wrapper made from mashed taro root. The filling includes pork, dried shrimp, and Chinese dried mushrooms.